Matrixvisa Issue No. 2/2017 – Matrixvisa Goes to Parliament, Namibia & SA Meetings May 2017 — MATRIXVISA INC.
Cobus Kriek, the Owner of Matrixvisa Inc, was invited by the ‘Canadian Parliamentary Standing Committee on Citizenship and Immigration’ to appear before the committee on 5 April 2017. He will be providing an opinion about the role of oversight bodies in regulating and providing adequate oversight of regulated Canadian Immigration Consultants. Matrixvisa receives dozens of complaints about so called “Ghost agents” or unregulated agents in South Africa and Canada every year. Last year we reported some of these individuals to the Canadian Federal Prosecution Service. We hope that our contribution to the committee will further assist to protect the public from unscrupulous immigration agents. Our contribution to the Committee will be made available on our website after we make the presentation. We are pleased to announce that Matrixvisa will be visiting Namibia for the first time on our next trip to South Africa in May 2017. Thank you to those Namibiers who expressed their interest, we hope to see you in Windhoek! Please note however, the Royal College has just transitioned to requiring either the MCCQE Pt. 1 & 2, or the USMLE Step 1, 2 & 3 as the screening examinations. However, as this has just transitioned, we are still accepting the MCCEE to fulfill this requirement for applications for the 2018 season. It was reported that despite the downturn in the oil price there are still 44 000 vacant jobs in Alberta (CBC, 5 March 2017). Many of these seem to be in the food services and hospitality industries. Canada’s national unemployment dropped to 6,6 % in February 2017 which is the lowest it has been in 2 years as Canada added 15 300 new jobs to the economy in February 2017. Canada has developed 288 000 jobs from February 2016 to February 2017, with the majority during the recent 6 months (Globe and Mail 10 March 2017). Most of the gains have been in Manitoba, Saskatchewan and British Columbia. The Fords Motor Co in partnership with the Federal and Ontario Government is taking a step forward to diversify and maintain the Ontario automotive industry. 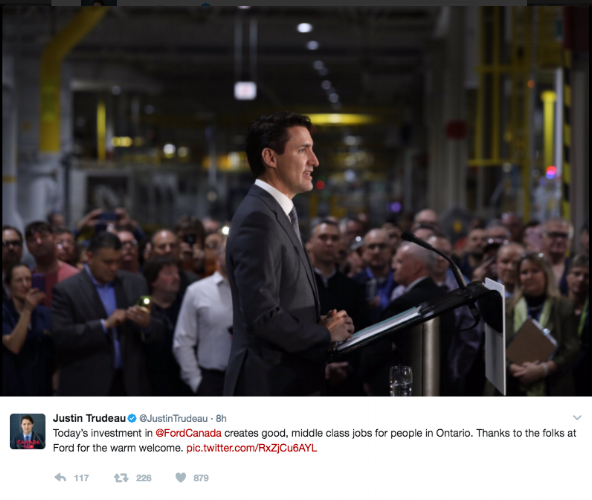 On 30 March 2017, the Globe and Mail Reported that Ford Motor Co will be investing 1.2 Billion CAD in the creation of a research and development centre in Ottawa and other related centres around Ontario. The Ottawa research centre alone plans to employ 295 engineers. Ford's Windsor Ontario plant will also begin building a new V8 in maintaining a focus on manufacturing. The Federal Government and Ontario Provincial Government has also announced a 100 Million CAD investment in support of their partnership with Ford. Together the investments will directly maintain or create almost 800 jobs. This is not to mention the positive effects that this new economic branching of the automotive industry will have for Ontario and Canada. The Canadian federal budget was made available for 2017 and it was reported that the budget deficit would be CAD28 billion for the 2017/2018 financial year. The government promised that the books will be balanced by 2019/2020. By that time the Trudeau government might have been voted out on the election of October 2019. To read more about the Budget, navigate to the Government of Canada Budget 2017 website. A mine in Sudbury, Stobie Mine, owned by Vale has announced its closure with 240 jobs now at risk. The mine has been in existence for 100 years but the quality of the ore has dropped and the mine is not viable any more. In our opinion the possibility of foreign nationals getting jobs in the Northern Ontario (Sudbury, Timmins) right now is small, unless an applicant has unique skills. President Trump is supporting the extension of the Keystone XL pipeline from Canada to the USA. That is good news for Alberta and for Canada as a whole. However, the Trump government has placed Canada on notice about Canadian softwood lumber exports to the USA. The US administration stated that Canadian companies get their lumber from Crown land for a rock bottom price which is essentially viewed as a subsidy to the Canadian producers of softwood lumber, and an unfair advantage to US Softwood Lumber companies. To read more about the development and history of the Keystone XL Pipeline and the Canada- US Softwood Lumber relationship see our February Newsletter, Matrixvisa Issue No 1/2017. During our most recent visit to South Africa (we visited Johannesburg, Vryburg, Durban, Port Elizabeth and Cape Town) most immigrants asked us about the cost of living in Canada. We always referred people to an extensive discussion about this issue on our website, the Cost of Living. While we felt telecommunications services (Internet, landlines and wireless phones) were more expensive in Canada, a 2015 report shows that Canada is not more expensive than many other countries. See the Canadian Radio-television and Telecommunications Commission's 'Price Comparison of Wireline, Wireless and Internet Services in Canada and with Foreign Jurisdictions'. Housing in Vancouver and Toronto areas can be some of the most expensive in Canada. In a positive development, it was reported in the Vancouver Sun on 23 March that the number of foreign buyers has dropped to about 3 percent of the total value of real estate purchases in February 2017. This is a significant drop from the 16 percent of the total value of real estate purchases in 2016, before the British Columbia government brought in a 15 % tax on foreign buyers. Foreign buyers were blamed for the sharp increase in real estate prices in the Greater Vancouver Area. It was reported by CBC that up to 21 000 Ontarians went to hospital during 2015 for slipping on ice. Slipping on ice can be minimized by wearing the correct boots and by always keeping some ice cleats in your winter jacket. The heavy duty version does not fit in one’s pocket that easy but light duty one’s can easily be kept handy in a jacket pocket. In the website Rate My Treads 98 pairs of boots were tested to help consumers to choose the correct boots. It was reported in the the Regina Leader Post by Pamela Cowan that 380 deaths were caused by carbon monoxide in Canada between 2000 and 2009. In comparison, an estimated 3,200 Canadians die per annum from radon-induced lung cancer. A radon test kit can be purchased for $50. It was reported in the Guelph Mercury on 16 Jan 2016 that a Health Canada study found that 6.9 per cent of Canadians are living in homes with radon levels above the current guideline. Although the domestic prevalence of radon varies widely across the country, the greatest number of homes with high concentrations were found in Manitoba, New Brunswick, Saskatchewan and the Yukon. It was also reported that every home has radon in it — the material question is how much. Radon is measured by becquerels per cubic metre (Bq/m3). It is a naturally occurring gas in the ground and seeps into homes through cracks and drain pipes in the basement. If the level of radon in your home is less than 200 Bq/m3, Health Canada radon guidelines say no action is required. If the level is between 200 and 600 Bq/m3, the home should be repaired within two years. Homes with levels above 600 Bq/m3 should be repaired within a year. Once detected, radon can be eliminated with a simple system that draws the gas from beneath the foundation through a sealed exhaust pipe connected to a fan. The gas is released through a vent in the home’s roof or through the side of a building. Systems range in price from $2,500 to $5,000, depending on the age of the home and material its built on. If the radon level is high, people should search for a radon mitigation expert at websites such as the website Take Action on Radon. Experienced Electrical technician or Electrical engineer with hands on automation experience and PLC experience. An employer in SK contacted us to search for a farm manager with experience with cattle in pasture and a feedlot.